I recently had a request by a customer to disable WiFi on their laptops. I know, crazy, right? They had their reasons though and it was a temporary solution to a problem. The issue with disabling Wifi is that there isn’t actually a group policy which directly allows ‘disable wifi’ but the workaround is pretty easy. Essentially we need to disable the WlanSvc service. Create a new GPO. Browse to Preferences | Control Panel Settings | Services. Right click in the right-hand pane and select New | Service. Call it WlanSvc. Ensure the service name is WlanSvc. Note, you’ll probably not be able to find this service if you browse via the ellipses unless the machine you’re using for administering group policy is a laptop. This is why it’s important you name the service correctly. Under Service Action change to Stop Service. 5. 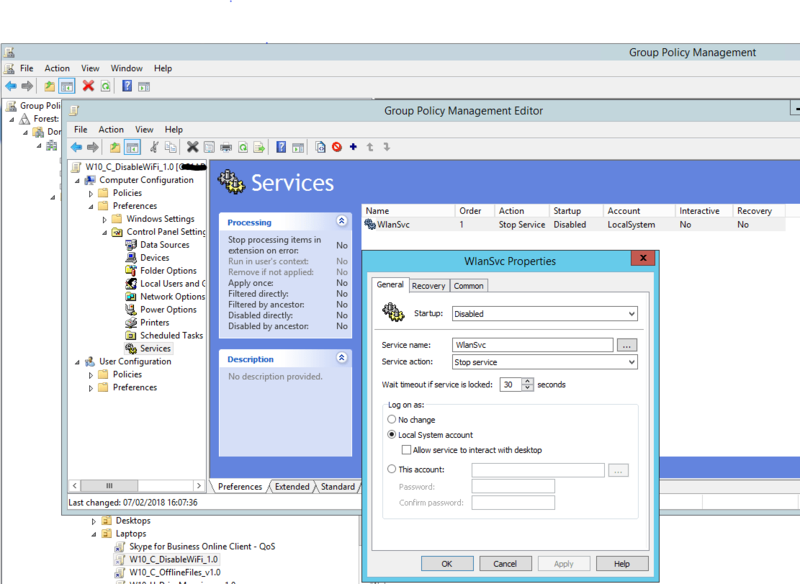 Apply the group policy. Note, you will probably need to reboot the machine for everything to take effect properly. You may notice a short pause before full (wired) network connectivity kicks in, maybe about 20 seconds. After this you should see that wireless is disabled.